Sometimes being lazy can even save you money. Take this hand-me-down hair bow: limp, twisted, & one step from the trash. (a.) Spend 1/2 hour searching Ebay for just the right bow. (b.) Settle for the $8 small bow I saw at Strasburg. (c.) Visit Michael's and buy supplies to make my own. Or (d.) Make do, because I don't have time or energy for the above! I walked 5 steps to my kitchen, where I wet the bow and sprayed it with starch. After stuffing tissue in each loop, I let it dry overnight. Who knew a quickie solution could be so satisfying? Next week, stop by Ann Kroeker's to share your own Make-Do-Monday stories! I'd hardly call wetting, starching, and reshaping a hairbow lazy! What a clever idea! I wouldn't have thought of starch as a solution for that. Well, it only took less than 5 minutes, tops. Compared to the other options that seems downright lazy to me! Genius! And though we don't wrap fancy packages or do up our girls' hair, someone gave me a gift with that exact ribbon around it--and I kept it. Now I'm glad I did. Hmm....what needs a pretty bow around here? As usual, you're my inspiration when it comes to homemaking and frugality. Thanks for the linky-love. I'll have Make-Do Mondays up on, well, Monday and will grab this post then. Get some sleep and get rejuvenated, friend! I'm up with Mr. Fussy tonight. Neat! I would never have thought to do that. I usually just toss wrinkled ond bows...or I did until my nine year poo-poo them for more sporty accessories. Sniffle. They grow up so fast. Enjoy those bows while you can. That's a $16 bow - Dillard's is written alllll over that pretty bridal shop duplicate of a bow! So, I'm high-fivin' you right now! you always leave me speechless - I heard a pin drop this time! Make do! Yes, indeed. I do this kind of stuff all the time. How about the flower girl dress? Did you purchase it at Strasburg's? I was in the one in my area yesterday and they do have to-die-for dresses and they have a sale now. Congrats on the recycled bow! Great job Meredith! 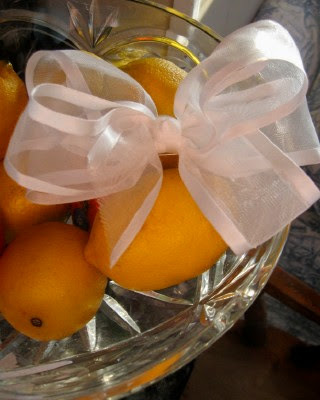 Ribbon is easy to revive - and now you know! I use steam from the tea kettle to fluff crushed bows - a trick I learned working at a florist's shop. Most woven ribbon washes well in cool water, and if the ends get raggy and need to be re-cut there is this amazing product on the notions wall called 'fray check' and is has 100 uses including rescuing ribbon ends that would otherwise fray - failing that, clear nail polish works to tidy up ends of ribbon too! well, i was going to suggest untying the bow, steampressing and spray starching, then re-tie (which I do with package ribbons) but your solution was way quicker and just as pretty! Another great solution! I miss those hair bow days! The flower girl dress is especially pretty--and at an especially good price! I will share the photos and the story after the wedding. It is hard to find a white dress in winter, unless you go with a super-puffy flower girl dress from the bridal shop. Those are too big in scale for Elise. She's only 50% likely to make it down the aisle, so I was reluctant to buy one from Strasburg. It does have better quality than the bridal shops on white dresses--and during sales, at competitive prices. Can't wait to show you how pretty she looks! What a wonderful idea! Sometimes the simpliest idea is the best of them all! 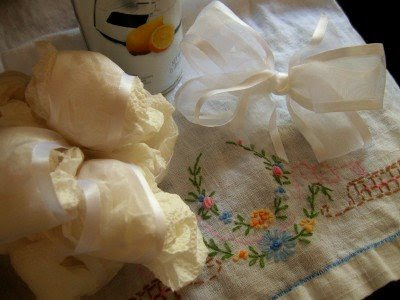 I did the bow thing a lot for awhile and agree starch and tissue paper is such a great way to revive them. Also if you have fraying on the edges, going back and forth with a butane lighter will help reseal them and make them look like new again. Well, there ya go! You are always an inspiration, my dear! Ah, Hairbows. I love little girls hair bows. I've never tried starching them before. That's a good idea. When mine get dirty I just use baby shampoo on them and clip them to a hand towel to dry. I found grab bags full of Scuncie hair bows and bands at Walgreens and some had the cutest hair bows. I forced myself to walk away though. If you keep your stuff nice then there's no need to replenish or replace. What a fantastic idea! I have loved reading your blog posts about veggies/fruits/etc to have on hand. That sure does cut down on the "i-wantsy" in the produce department. I love reading your blog! Such great ideas! Great job on the "recycling", Meredith! I can't wait to see the dress. Elsie looks like such an angel anyway - I'm sure she'll be gorgeous all dolled up in white. You are so clever! I'm not sure I would've thought to do that! Great idea on th bow! I used to use tricks like that all the time when my daughter was little. I love bows, but I love to just tie a ribbon in their hair, too. Poor little guy is still not sleeping well? He must be so miserable. I always thought that I may be losing sleep, but my little ones are losing sleep AND hurting! That is a rough combo. At least I wasn't suffering, and they can't even tell you! I always felt so helpless! I look forward to pics of the wedding. Using old fashion domestic skills rock. Way to help bring it back. 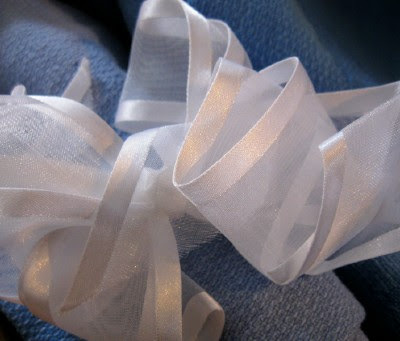 I make most of T$'s bows...here's a frugal way to keep the ends from fraying. Instead of buying FrayCheck, I just use a lighter to singe the edge of the ribbon. It is SO satisfying when you give something a whole new life. It was those little things that I remember from when my children were young. Once when I was so broke I got out all their tube socks and repaired them a la Tightwads Gazette. I LOVE to hear things like this!!!! It shows REAL conservation, ingenuity, and creativity!! Our Great Grandmothers would be pleased!!! When my oldest daughter was a baby I got her 1st boutique bow for 14 dollars, hahahahahaha! What's the 1st thing she does? Take it out and gone forever at the zoo. That was the day I said NO more! I got all the supplies, read up on how to make them, get ribbon on sale when I buy and have been making them ever since. Now I have 3 daughters and have not bought a bow in 8 years and would say I have over 100 of them now and make them for friends and family.